HomeGutenbergWordPress 5.0, Avada, And You. All That You Need To Know. All things Gutenberg are afoot. We have released several articles following the progress of Gutenberg and how it affects Avada and the entire WordPress arena. What is Gutenberg? read about it here. Gutenberg, the new WordPress editing experience has been in plugin form (external to WordPress Core) for quite some time now, requiring you to install it in order to try it out. The reason why Gutenberg was not incorporated into WordPress core thus far (pre WP 5.0) is for testing and feedback purposes, allowing the core WP and the Gutenberg team to gather more data and feedback on how Gutenberg functions and interacts with users installs in the wild. In this post, we will be covering a fair amount and we encourage you to go through it all. 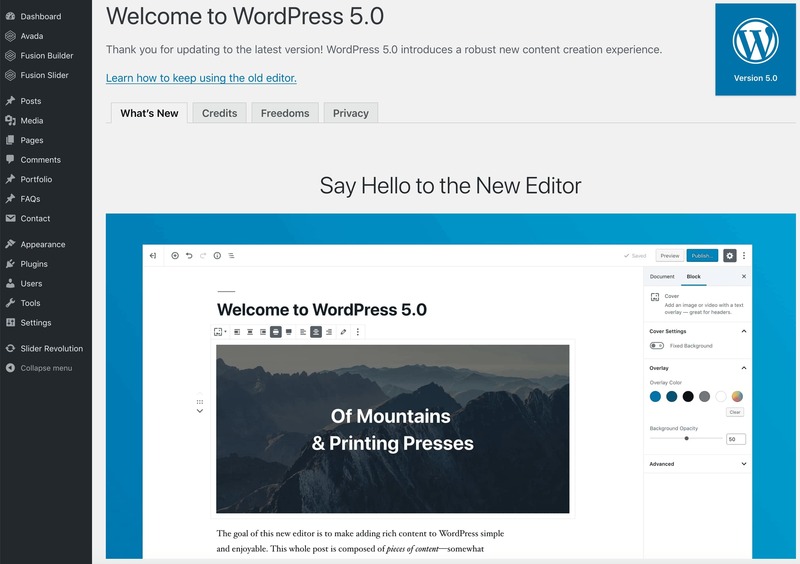 WordPress version 5.0 is slated for release on November 19th, November 27th, December 6th (there is a backup release date of January 22, 2019 if more testing is required), adding Gutenberg to the WordPress core and how this affects you is detailed below. What Do I Need To Do In Preparation For WordPress 5.0? This will depend on the Avada version you are currently running. If you are already running Avada 5.7.2 (latest available version is: 5.9) you are all set and good to go. Otherwise we recommend updating Avada to the latest version. Always make sure that you check and follow the detailed instructions for updating your theme. The importance of maintaining your site by making sure that your theme and plugins are regularly kept up to date, cannot be overstated. If you can’t update to the latest version of Avada just now, we have you covered too. Already running Avada 5.7.2? Nothing to do! Running Avada below 5.7.2? Don’t panic! What If I Can’t Update Avada, Will My Site Break? You can expect the same seamless working experience that you are used to with Avada and WordPress. Both, Avada and the Fusion Builder, will be unaffected and this includes the front-end of your site. Additionally, feel free to try the WordPress 5.0 Gutenberg editor. We added options to either create a post on Gutenberg or within Fusion Builder, your choice. You can’t edit a page/post created with Gutenberg in the Fusion Builder or vice versa, however, you are free to try Fusion Builder Elements in Gutenberg. More information please read our help file. We have implemented the option to choose between the Fusion Builder and Gutenberg when creating new pages or posts as illustrated below. IMPORTANT NOTE: If you create a page/post with Gutenberg you can’t edit/maintain the same page/post with the Fusion Builder and vice versa. They are not interchangeable. Choosing Gutenberg gives you this -> https://d.pr/i/7N1lJP – note the Edit with Fusion Builder button, top left. Can I Also Use The New Block Editor? Yes, you certainly can. What must be noted is that if you create a page/post with Gutenberg you cannot edit/maintain the same page/post using the Fusion Builder and vice versa. They are not interchangeable. Any Gutenberg page/post created will display perfectly on the front end of the site to anyone viewing it. Updating From An Old Version Of Avada? Something else that is important is to also ensure any patches that our team releases between update cycles are applied as part of ongoing maintenance for your install and always clear your cache plugins post update. The short answer is: No. The front-end of your site will be unaffected and everything will remain perfectly functional, not affecting your website visitors. It is the WordPress back-end of your install where you will have obstacles. If you have not updated your Avada theme to the latest version, it won’t be possible to edit posts/pages with the Fusion Builder, that is why we strongly recommend updating to Avada 5.9+ before you update to WordPress 5.0. See our detailed update instructions. 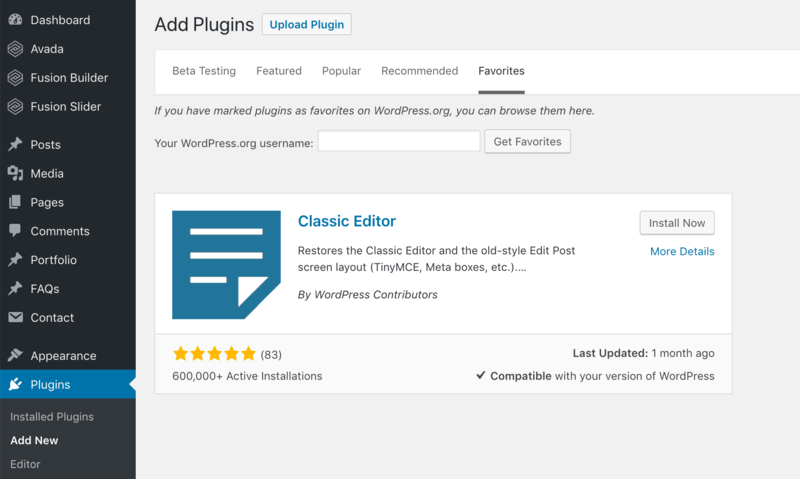 The Classic Editor plugin is developed and maintained by the core WordPress team and will be officially supported until December 31, 2021. Install and activate the Classic Editor plugin. It does what it says on the tin and will sideline the WordPress Gutenberg editor upon activation. The plugin also makes it possible to keep both the Gutenberg and the Classic editor at the same time, configured the in the plugin’s settings. Go to WordPress Dashboard >> Settings > Writing page, you will see the option under “Classic editor settings”. All of this means that the traditional WordPress editor is active and Fusion Builder is enabled for all pages and posts. This method allows you to to disable the WordPress Gutenberg editor for certain or all user roles and post types and override any Gutenberg related nags. Install and activate the Disable Gutenberg plugin. Upon activation, go to the >> WordPress Dashboard > Settings > Disable Gutenberg page to configure the plugins settings. If I Choose Not To Update WordPress, Will Avada Work? Yes, of course, Avada will work perfectly with the 4.9.8 version of WordPress. You can delay updating to WordPress 5.0 if you have accessibility concerns or are simply not ready to do so at this time. We do feel that the new editing experience for WordPress is in the right direction, it is however, the delivery of this project that we do not agree with and we are not the only ones to feel this way. As a team, we have been closely monitoring the Gutenberg/WordPress 5.0 development cycle. This being necessary, because we have no control over the development of WP core, to ensure that we can deliver the an experience to our user-base that is as seamless as possible. Due to constant changes by the WP core team it has been very difficult for us to have anything prepared months in advance of the 5.0 release. From user facing functionality, accessibility, and even back-end functionality, preparations have been difficult but conscientious on our end. When we released Avada 5.7 on October 1st, we included a layer of Gutenberg compatibility. It made sure that you can work with Avada and Fusion Builder just in the way you are used to. Since Gutenberg was a plugin prior to WordPress 5.0, and not yet merged into core, we implemented a compatibility layer for the plugin. More changes were made by the WordPress core team for which we have made further adjustments to ensure a seamless experience for Avada users. “Prefer to stick with the familiar Classic Editor? No problem! Support for the Classic Editor plugin will remain in WordPress through 2021. There has been significant discontent with regard to overall accessibility and the new Gutenberg editor. On October 30th, WP Tavern released an article with a sobering assessment of the accessibility status of Gutenberg. You can read the full report from Joe Dolson here. In the subsequent WordPress Dashboard >> Plugins screen, click “Install Now” then activate the plugin. Installing the Classic Editor disabled the new Gutenberg editor as default and gives you the traditional editing experience for pages and posts. Millions of people around the world make a living off of WordPress and the extended ecosystem. Each and every day millions of people leave their indelible mark on the internet through the WordPress sites, plugins and services that exist. With the launch of WordPress back in May 2003, Matt Mullenweg made it clear that WordPress was intended to make ‘Blogging’ accessible to anyone and everyone. WordPress has since has evolved into a full-featured Content Management System and web publishing platform for the masses. There has been very public concern and a fair amount of disagreement in regard to the readiness of Gutenberg. For the most part about the sheer amount of change within the WordPress core and what some feel is the lack of democratic decision making for the timeline of Gutenberg’s release. There are those that applaud the new editor for certain workflows and the need to update the editing experience within WordPress and others that emphatically state it should be an optional plug-in you can use to replace the current established TinyMCE editor if you so choose to and not added to the core of WordPress. With an average rating of 2.3 out of 5 stars, the new editor and intended deployment has had a rocky start. Regardless of the perspective on Gutenberg, the most resent outcry has been down to the timing for the latest release date for WordPress 5.0. The date had changed a few times and a final, hard release of December 6th was announced. Our team will continue to monitor the WordPress development cycle. As has and always will be the case, we are dedicated to delivering the best working experience to everyone who uses our products, with any new version of WordPress. 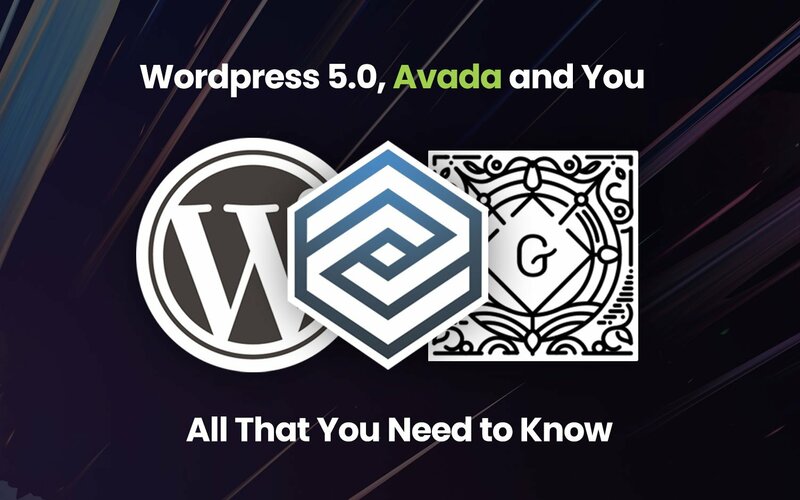 We will also continue to release up to the minute documentation for anything that Avada users need to be prepared for and functionality pertaining to WordPress and future progress. WordPress, Gutenberg and Avada. Let’s Begin. Great info, Michael. This is exactly why I use Avada for all of my clients! Not only is it the best WordPress theme, the developers are top notch and stay ahead of the curve. That’s customer care taken to the next level. As always, great work. Bravo to all. Thank you very much for your kind words, it motivates our entire team to keep on doing their best to be the best. Thank goodness I use Avada. Your customer support and attention to user concerns is impeccable… not to mention I love fusion builder. Thank you… again. We run Avada on all of our WordPress sites, and having become used to Fusion Builder already, the whole Gutenberg UI seems like a moot point since we won’t be using it. I’m more concerned about core WP stability and security, so with any big version change (4.9.X > 5.0) we’re weary of upgrading right away. Kudos to Avada for staying on top of WP 5.0 compatibility as best as they can. Hi Guys, Gutenberg in WP5 doesnt work in Portfolio post types, still has classic editor? Ever since I updated to WP 5.0 I am unable to add a new fusion slide or edit an existing slide, it just loads a blank white screen. At my site salvationpress.com it has messed up my cart and other selling functions how can I fix these issues? It answer a lot of questions about this moment. And the good news was to know that our preferrable theme AVADA will work together with Gutenberg without cross editing and, plus, letting us to use Classic Editor as well. That is why we really trusth in Theme Fusion and AVADA in our business. We have clients that uses AVADA as framework to build pages and Classic Editor to post in their blogs. Maybe, for those who want more flexibility while posting your thoughts on blogs, Gutenberg can be a very exciting experience for our clients. But, we are taking care about the page structure of the sites, informing our clients to “not cross the secure line”, letting the page structures intact using Fusion Builder. Maybe, another good ideia to use Fusion Builder and Gutenberg in the same project is let clients with few – or no experience – create their own landing pages for specific objectives, while we take care of the site structure using Fusion Builder, keeping always in mind that post won´t have cross editing, a good ideia to separate client content from agency content and development. In summary, we have a lot of projects using AVADA and more projects coming soon. We was a bit worried to buy new licences without to be sure about the compatibility. At this time, we believe 60% of our work uses AVADA, while only 40% are hand made using php template design. Again, read this post was very good to keep the future in our plans. Hi Alex. Thank you for your feedback, we appreciate and we hear ya. Also, thank you for choosing Avada. As a team we always do what needs to be done to stay ahead of the curve, WordPress, the new editor and a seamless experience for our user-base is of utmost importance to us. Hi, thank you for your article. Nice to know what’s going on with the editor. I updated to WP 5.0 and was wondering how I can keep using the Fusion Builder editor for my pages and posts… I can’t find a button to switch back from Gutenberg to Fusion Builder editor. Hi @Sebastiaanjp. Please read the article above, it clearly explains what it is you need to do. If you need to update your theme to the latest version, update instructions are provided. Installing the Classic Editor plugin disables the new WordPress editor as the default editor. Yesss… sorry I must have read past this part. It works like a charme though. Thank you so much. I use your great Theme Fusion since a while without problems. I have just updated WordPress to version 5.0. After the update all my website pages cannot use anymore the function: Edit with Fusion Builder . Besides the update to WP 5.0 changed the lay out of the home page from 100% width to website page width. PHP version: 7.1.24. WordPress recommendation: 7.2 or above. See WordPress Requirements for details. Can this be the problem that: Edit with Fusion Builder function, is not working? To find out if a plugin cuased the Fustion Builder content error I deactivated all 3rd party plugins. Appearently the embed content by this plugin gives a conflict with Fusion Builder. I used the Embed Any Document also before the update to WordPress 5.0 and the Fusion Builder content error not appreared. What seems to be the problem of the conflict in WP 5.0 between the Embed Any Document plugin and Fustion Builder plugin? You will need to check in with the plugin author, as you said, the issue appeared after you updated to WordPress 5.0. The latest version of Avada has been out since November 8th > https://theme-fusion.com/documentation/avada/install-update/avada-changelog/ – thereby this cannot have anything to do with Avada. I tried to create new page just with container and text block element. After saving same error appear. I have found problem. WPML cause the problem. Cloud you check why there is error ““Your page content could not be displayed as a Fusion Builder layout. Most likely that means, there is some invalid markup or shortcode in it.” when WPML installed. I have found problem. WPML cause the problem. 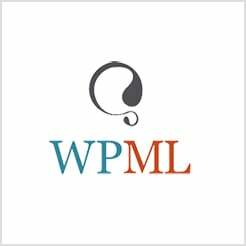 Cloud you check why there is error when WPML installed. Thank you for reply. WPML team helped me. Activating ‘Classic Editor’ plugin is fixing the issue. On a multi site I can’t see the fusion builder button on top left. Is this something known? Hi Marco, there will be no issue with that. The Fusion Builder works as expected on a multi-site installation. Hi, I want to check why fushion builder is not able to work? When add a new page, only shows classic editor. May you pls. give advice to fix it. I don´t like the new editor. I prefer the old wordpress editor, so i hope the last version improves soon. Hey there. Are you referring to the Classic Editor plugin version?